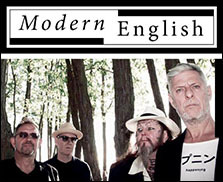 LOS ANGELES (CelebrityAccess) — New wave legends Modern English have cancelled all of their outstanding tourdates March and April while the band's guitarist Gary McDowell is treated for a serious but undisclosed medical condition. According to the band, McDowell was hospitalized after their show in Los Angeles on Friday for emergency surgery and then flew back to the UK for additional treatment. "All of us, Gary especially, are very sorry to have to announce the sudden cancellation of our “Take Me To The Trees” U.S. and Canadian dates. This is due to a serious illness and urgent surgery required for our guitarist Gary. Obviously we are very upset and disappointed to have to come to this decision, but without Gary we can’t play any concerts. After recovering from surgery, Gary will be flown home to England for further treatment," the band said in a statement released to Paste Magazine. The group says they hope to reschedule their dates once McDowell is ready for the road again. The group had an extensive series of dates scheduled in North American through April.